Once a little fishing village, Richards Bay is now a busy harbour town and popular KwaZulu-Natal Holiday Resort. Enjoy activities like swimming, surfing or bird watching. This KwaZulu-Natal town is also close to a lot of World Heritage Sites, Big Five game parks and the Zululand and its typical culture. The wonderful lagoon attracts locals and internationals likewise. Visitors are offered a lot of recreational opportunities and are using Richards Bay as a starting point for exploring KwaZulu Natal and bigger cities like Johannesburg in Gauteng. Richards Bay is the real gateway to Zululand and Maputaland. This South African town is situated on what was originally a floodplain, located about halfway up the north coast of KwaZulu-Natal between Durban and Kosi Bay. Richards Bay started out as a small fishing village with a temporary harbour during the Anglo Boer War of 1879, Admiral Sir F.W. Richards, a commander of the British Naval Division was stationed here and the KwaZulu-Natal town was named after him. 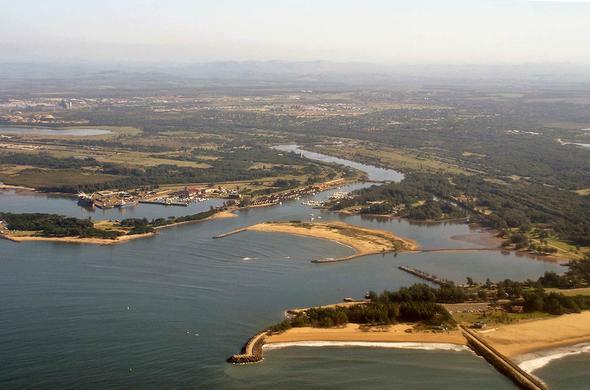 Richards Bay lies along a lagoon on the Mlatuzi River and its potential as a great natural harbour was confirmed after a detailed survey was carried out. Richards Bay now has the largest export coal terminal in the world where 65 million tons is loaded every year at this town in KwaZulu-Natal. Many specialised ships that stop here are a must-see for maritime enthusiasts. Richards Bay Minerals enormous operations top the list of Industrial Tourism opportunities. Apart from harbour and mining activities, this town has wonderful wetland scenery as well as unspoilt beaches. Richards Bay forms part of the Zululand Birding Route which includes the harbour and Game reserve called New Mouth; some rare birds like the pygmy goose and cuckoo hawk can be seen here.During the formalising of Richards Bay, a sanctuary was created on the southern side on the Mlatuzi River which includes the estuary, one of the most important estuarine habitats on the Zululand coast; the large Zostera beds provide a nursery for fish, crustaceans and a variety of marine / aquatic organisms. The town is laid out on the elevated northern slope of the lagoon, overlooking this fine view of water. Today it is a vibrant and busy town and has every modern amenity, with excellent recreational facilities for residents and visitors alike. Richards Bay in KwaZulu-Natal is relatively close to the bigger cities of Gauteng and provides a quick escape to get away from it all; the weather is warm all year round. Activities that can be enjoyed here include visiting the numerous art galleries, bird watching, fishing, swimming, surfing and canoeing. It is the gateway to Zululand, a land of exquisite beauty and magnificent diversity. There are some fantastic drives around the Richards Bay area such as the road to Eshowe from Gingindlovu through the Nkwalini Valley and Empangeni. Driving north from Richards Bay, visitors will find a wonderland of World Heritage Site wetlands, lakes, wonderful unspoilt beaches, mountains, renowned Big Five game reserves and authentic Zulu culture.